Following the aftermath of War of the Green Lanterns all the new recruits are discarding their rings since they were recruited wrongly. One of them however decides to not hand over her ring. She is Qurina, a cop on her planet who was commandeered by Krona until John Stewart killed Mogo and Guy Gardner ripped Parallax out of the central power battery. 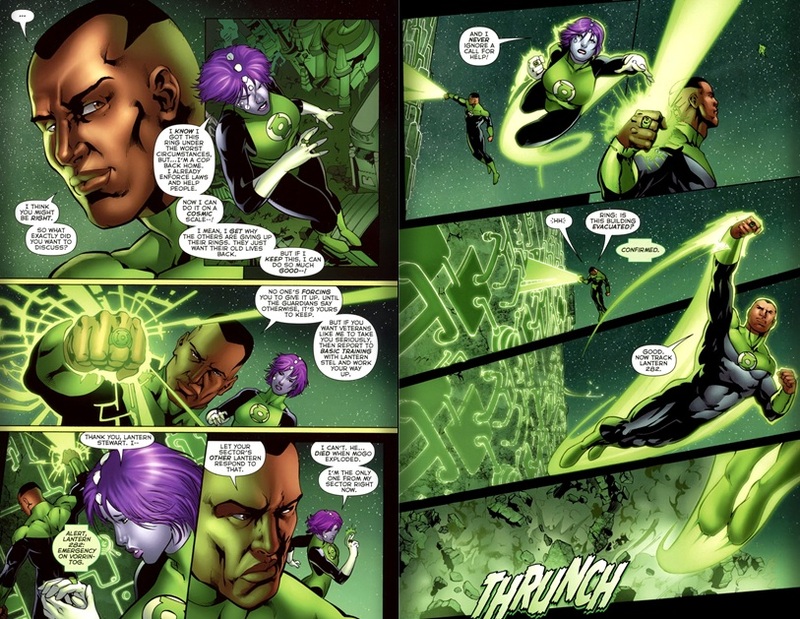 Qurina approaches John Stewart for guidance when a distress signal from her sector goes out. She and John rush to the scene. Her lack of thought almost escalates the situation until John finds an amicable way of ending the conflict. Qurina is left in awe of John, while he returns to OA and flies through the asteroid belt that was once Mogo. Art-Daniel Hor’s pencils gets complimented well by the inks of Keith Champagne combine that with the colors by Nei Ruffind and you have a very good looking comic book. Not extreme on the realism and not too cartoony but somewhere right in between. Story- While it was expected that this would have been a slow paced issue. 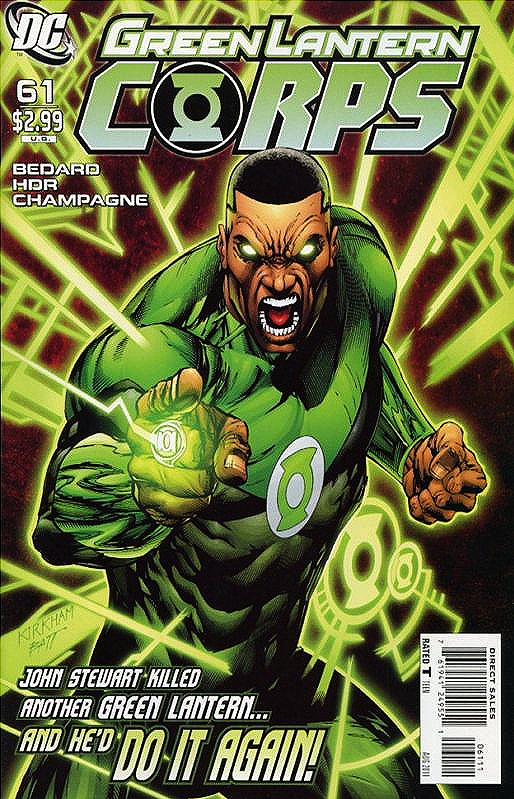 Writer tony bedward added a pint of action and started dealing immediately with the fallout of war of the green lanterns. Qurina was an easily understood character, easily accessible and John got the chance to play mentor to this young misguided recruit. The similarities between the two made they play of each other well; Military background, hot heads, shoot first think after. It also allowed for Bedward to show how much John has grown since those early “angry black man” days or yore. Cover- While the cover is illustrated well, the false advertising found there was disappointing to say the least. Character design– I’m sorry but the design of Qurina left allot to be desired. It’s annoying when sci-fi books like this defaults on new characters being humanoid in shape. I also got a very Katma Tui (Johns dead Wife) vibe from the new character…..maybe this was intentional but to me it was a bit contrived and took me out of the story.